"Sampath Speaking" - the thoughts of an Insurer from Thiruvallikkeni: ISRO - PSLV C35 successfully launches 371 kg SCATSAT-1 Satellite +7 co-passenger satellites . ISRO - PSLV C35 successfully launches 371 kg SCATSAT-1 Satellite +7 co-passenger satellites . Our Nation is feeling happy and proud because of the achievement from Sriharikota, in neighbouring Andhra Pradesh. This place is in Nellore Dist, separates Pulicat lake from Bay of Bengal. The nearest town and railway station is Sullurpeta. Indian Space Research Organisation (ISRO)today (26th Sept 2016) successfully placed advanced weather satellite SCATSAT-1 and seven other satellites in orbits in its longest ever launch mission, which spanned over two hours and 15 minutes. SCATSAT-1 is a continuity mission for Oceansat-2 Scatterometer to provide wind vector data products for weather forecasting, cyclone detection and tracking services to the users. The SCATSAT-1 was launched by PSLV-C35 on Monday morning at 9:12 hrs (IST) on September 26, 2016 from the First Launch Pad of SDSC SHAR, Sriharikota. It is for the first time that satellites were placed in two different orbits with a single rocket. Vikram Sarabhai Space Centre director K Sivan said, "The rocket has placed all the satellites in precise orbits." The Polar Satellite Launch Vehicle (PSLV-C35) carrying the eight satellites took off from Satish Dhawan Space Centre in Sriharikota at 9.12am. Around 17 minutes later, SCATSAT-1, the main payload of PSLV in its 37th flight, was placed in the polar sun synchronous orbit at an altitude of about 730km. In its thirty seventh flight (PSLV-C35), ISRO's Polar Satellite Launch Vehicle successfully launched the 371 kg SCATSAT-1 Satellite along with seven co-passenger satellites . This is the thirty sixth consecutively successful mission of PSLV. The total weight of all the eight satellites carried on-board PSLV-C35 was 675 kg. 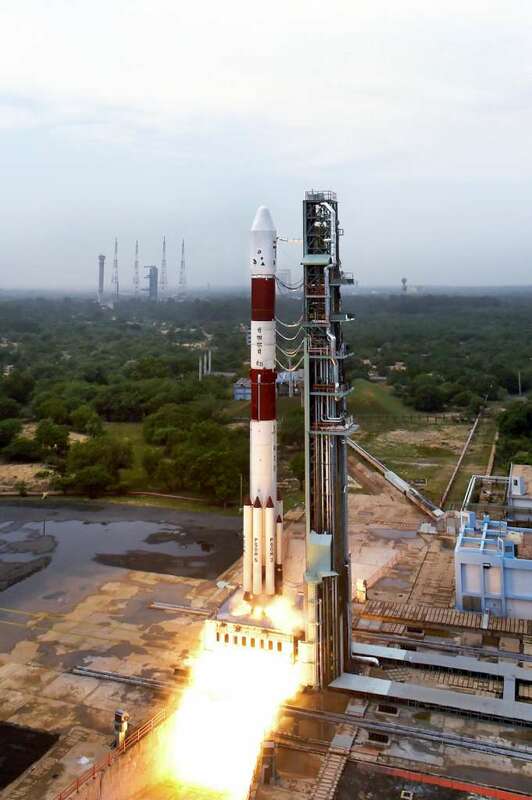 After a flight of 16 minutes 56 seconds, the vehicle achieved a polar Sun Synchronous Orbit of 724 km inclined at an angle of 98.1 degree to the equator (very close to the intended orbit) and 37 seconds later the primary satellite SCATSAT-1 was separated from the PSLV fourth stage. After separation, the two solar arrays of SCATSAT-1 satellite were deployed automatically and ISRO's Telemetry, Tracking and Command Network (ISTRAC) at Bangalore took over the control of the satellite. After the successful separation of SCATSAT-1, the PSLV-C35 mission continued. Still carrying the seven co-passenger satellites, the fourth stage of PSLV coasted over the South polar region and then started ascending towards the Northern hemisphere. A safe distance between the orbiting SCATSAT-1 and PSLV-C35 fourth stage was maintained by suitably manoeuvring the stage. At 1 hour 22 minutes and 38 seconds after lift-off as the fourth stage was in the North polar region, the two engines of PSLV fourth stage were reignited and fired for 20 seconds. As a result of this, it entered into an elliptical orbit measuring 725 km on one side of the Earth and 670 km on the other. Of the seven co-passenger satellites carried by PSLV-C35, two – PRATHAM weighing 10 kg and PISAT weighing 5.25 kg – are University/Academic institute satellites and were built with the involvement of students from IIT-Bombay and PES University, Bangalore and its consortium, respectively. The remaining five co-passenger satellites were international customer satellites from Algeria (three – ALSAT-1B, ALSAT-2B and ALSAT-1N), Canada (one- NLS-19) and the United States (one – Pathfinder-1). With today’s launch, the PSLV’s capability to launch satellites into two different orbits has been successfully demonstrated. The total number of satellites launched by India’s workhorse launch vehicle PSLV has now reached 121, of which 42 are Indian and the remaining 79 are from abroad. SCATSAT-1, which will provide weather forecast including cyclone detection and tracking, will succeed the now defunct Oceansat-2 satellite launched in 2009. One proudly recalls that in June 2016, India launched 20 satellites in a single mission, the most in the history of the country's ambitious space programme. Seventeen of those were foreign. Monday's launch takes the number of foreign satellites launched by India to 79. This has earned the country more than $120m (£92m). And India's space agency has already secured deals to launch dozens more foreign satellites. This is good news for a country that has often faced criticism for spending money on a space programme when it has problems like poverty and hunger to tackle. A remarkable day for the Nation ~ and we salute those scientists behind this great show.